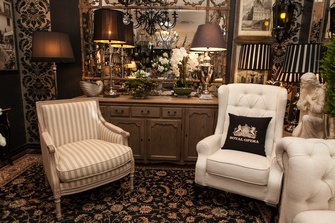 Parisian-inspired interiors hub The French Corner has expanded its Newmarket showroom to house even more gorgeous furnishings and homewares. The range of internationally sourced products features a timeless mix of French and Hamptons style cabinets, dining suites, bedroom furniture, lighting and finishing touches which will transform any room of the home in to an oasis of European chic. The French Corner, which opened in 2009, is dedicated to finding truly classic pieces from around the world – their eye for sophisticated, elegant design is second to none. Extensive travel through Paris and country France (including time spent in homes, chateaux, art galleries and antique stores) has armed them with the expertise to inject any look with renowned French flair – including gardens and outdoor living zones. This attention to detail and infallible style is available through an exclusive interior design service, which can be as comprehensive or consultative as you would like. So whether you’re searching for a small French trinket, gift voucher for a loved one or complete interior design service, The French Corner will not disappoint.